BomBora sits next to Lagoon-A-Beach, and comes complete with a beach/surfer theme to match the location. Additionally, the trains come complete with detailed theming, lighting, and an onboard audio system that randomly plays one of six beach-themed songs while a train runs its course. 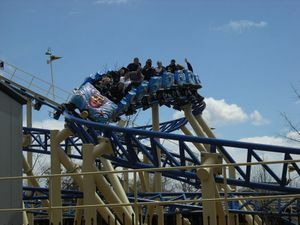 When both trains are in use, the coaster has an hourly capacity of 950 riders per hour. This page was last edited on 10 April 2015, at 11:14.